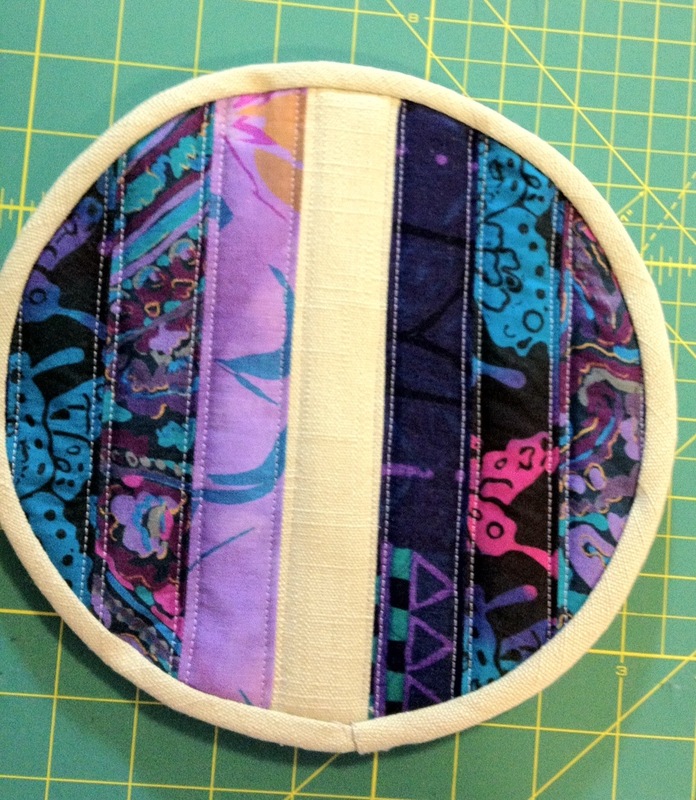 This week’s project from the Zakka Style sew along is a patchwork potholder. Kim from Retro Mama designed these potholders for the book. She has also updated the instructions for putting on the binding which can be found here. This was a pretty quick and easy project to put together. The great thing about these is that they are large and thick enough to make a nice trivet for the table as well as protecting your hands from a hot dish. I started the project by making a strip set. I had some strips that were already sewn together. Adding a strip of linen to those gave the potholder the look I wanted. After all, linen is the fun element of the Zakka Style projects! Strips sewn, layered with Insul-Brite, batting, and backing and then trimmed into an 8 ” circle. I layered 10″ squares of the strip set, a piece of Insul-Brite, a piece of cotton batting and then a piece of linen for the backing. A walking foot made quilting these together very easy. Once they were together I cut an 8 inch circle. 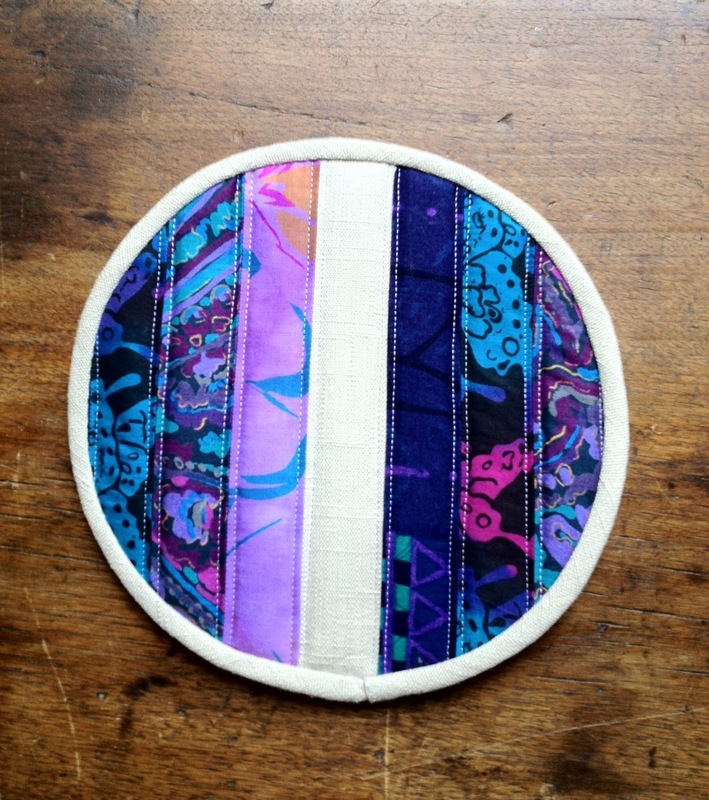 2 partial circles were cut out of linen and 2 out of a cotton print (which ended up unseen on the inside). The flat edge was bound and then these were placed onto the back of the round piece and basted around the edge. Now it was ready for the binding. 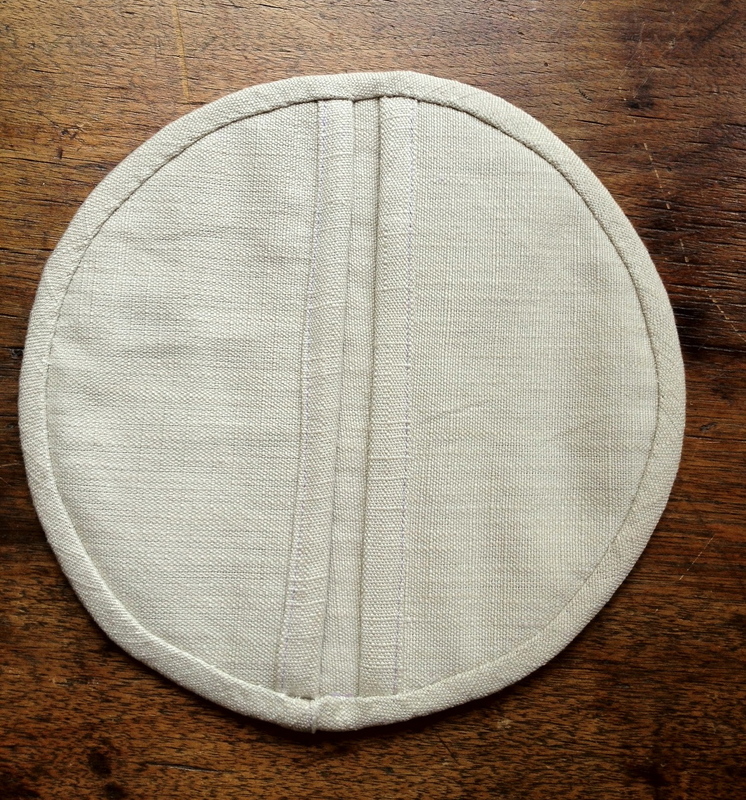 I have avoided binding in linen on other Zakka projects due to the fraying of the fabric. However, since this binding HAD to be cut on the bias, fraying would not be a problem so I went ahead and used it. Binding turned to the back. Ready for hand stitching. Unfortunately, I didn’t read the updated binding instructions and just overlapped and sewed the edge of the binding which did not give as clean a finish as doing it the other way would have. I look forward to trying it again and perfecting the binding. I’m happy with how this turned out and will be making some more for gifts. Any sort of quilted design could be put on the front and it would be fun to try some different things to make a useful and pretty gift.